"Sampath Speaking" - the thoughts of an Insurer from Thiruvallikkeni: Jeans ........... brought to you - designed by Lions and Tigers !! Jeans ........... brought to you - designed by Lions and Tigers !! Fashion statement (noun) – meaning : clothes that you wear or something else that you own in order to attract attention and show other people the type of person you are ! ; a designer-wear is considered a 'fashion statement' …. Even if you had stumbled upon this advertisement, you might not have thought it to be this way…. 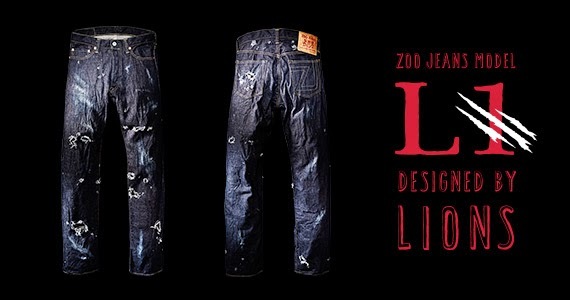 It read ‘for one week, beginning July 7, we are selling 3 pairs of zoo jeans – lion model (L1 & L2) and Tiger Model to the highest bidder on Japan’s Yahoo auctions – the profits will go the Zoo’s effort to preserve environment for animals as well to World Wildlife Fund (WWF) !!! After the dust from ‘veshti’ not being allowed in TNCA – here is some thoughts on another dress ….the fad of modern day youth (of both gender) – the ‘jeans’. Jeans are trousers made from denim – often specific to a particular style of pants, called "blue jeans" -invented by Jacob Davis and Levi Strauss in 1873. Starting in the 1950s, jeans, originally designed for cowboys and miners, has become extremely popular causal wear. Denim is a sturdy cotton twill textile in which the weft passes under two or more warp threads. It is a characteristic of most indigo denim that only the warp threads are dyed, whereas the weft threads remain plain white. As a result of the warp-faced twill weaving, one side of the textile then shows the blue warp threads and the other side shows the white weft threads. This is why blue jeans are white on the inside. Indigo dye is an organic compound with a distinctive blue color. It is the indigo that gives blue to blue jeans and almost all that is dyed now is synthetic. Now getting back to that auction – it was ‘4 cloths of damage jeans – described as zoo jeans’……… Japanese brand Zoo Jeans promoted as "the only jeans on earth designed by dangerous animals". ! – there are many fashion designers and you have F TV liked by many !! ….of the handful of famed designers – who is this dangerous animal ? - read further on ! Newspaper reports state that a Japanese zoo has taken the catwalk to a wild new level, using some of its fiercest inhabitants to rip and claw jeans to a fashionably distressed look. The facility northeast of Tokyo has unveiled "Zoo Jeans", styled by the fangs and claws of lions, tigers and bears. Zoo officials said the material held up well, all things considered. "We wrapped several pieces of denim around tires and other toys. Once they were thrown into the enclosures, the animals jumped on them," Zoo director Nobutaka Namae is quoted as saying , adding that the pieces were later patched together to create the finished product. "The denim was actually much tougher than we had thought, and it turned out nicely destroyed." The idea came from a Tokyo advertising executive who wanted to give something back to the zoo where he spent time as a child, Namae added. News reports suggest that bidding on the tiger-torn denim had soared to 121,000 yen ($1,200). 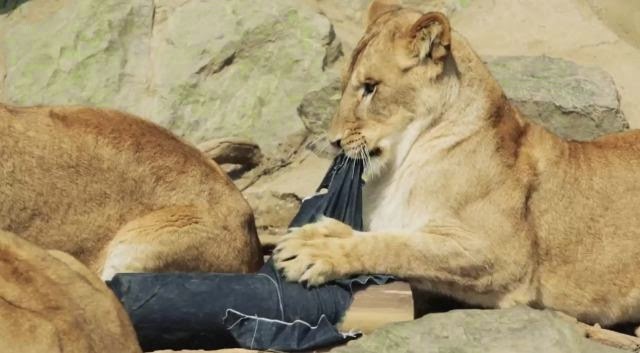 According to their website, Zoo zeans are the only jeans on earth designed by dangerous animals … the process being – first the authorities take their favourite playthings – old tires and giant rubber balls – wrap them in sheets of denim; return them to animals and let nature run its course. The animals roar, gnaw and claw at their toys – and when they are done, what’s left of the damaged denim is gathered .. it is from this unique fabric that they make the jeans – so the wild rips and tears in Zoo jeans have been created with animal instinct. Zoo jeans is an initiative of Mineko club volunteer group of zoo supporters launched in collaboration with Kamine zoo in Hitachi city with the goal of revivifying local zoo.